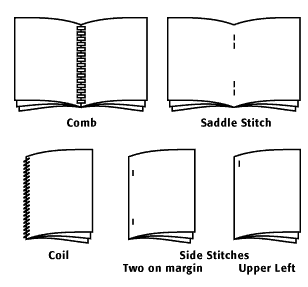 Accordion Fold - Sometimes called a "Z" fold, this bindery term means two or more parallel folds which open like an accordion. Adobe Acrobat - Software package created by Adobe for converting any document to an Adobe Portable Document Format (PDF) file. Anyone can open your document across a broad range of hardware and software using the downloadable, free software Adobe Acrobat Reader, and it will look exactly as you intended—with layout, fonts, links, and images intact. (Taken from www.adobe.com.) Click here to download software which allow you to create PDF files for free. Adobe Type 1 font - see postscript font. Against the grain - Printing at right angles to the direction of paper grain. This will cause folding problems. One way to work around folding against the grain is to score the paper before folding. Attachment - When referring to e-mail, an electronic file placed within an e-mail for the purpose of sending through the Internet. Banding - When the changes from screen percentage to screen percentage in a gradient can be seen, instead of a solid blending from dark to light or from color to color. Bind - To fasten sheets or signatures with wire, thread, glue, or by other means. Bindery - Where materials go for assembly. Cutting, folding, binding and boxing are some of the activities performed in bindery. Bleed - Ink which prints beyond the trim edge of the page, created for the purpose of allowing ink to extend to the edge of the page after trimming. Without bleed, cutting the product becomes extremely difficult and may sacrifice the quality of the product. For best results, create 1/8" (.125) bleed (past trim edge) on all edges where bleed is desired. Blind debossing - An image pressed into a sheet without ink or foil, creating a lowered area. See blind embossing, debossing and embossing. Blind embossing - An image pressed into a sheet without ink or foil, creating a raised area. See blind debossing, embossing and debossing. Blueline - A blue photographic proof used to check position of all image elements. Similar to a blueprint. Reno Print Store does not utilize this type of proof; instead, a color, full-size, low-resolution proof is output for our clients. Book Bindery Types - Some of the types of book bindery. Camera-ready copy - An archaic term meaning print-ready, mechanical art. Carbonless - Pressure sensitive writing paper that does not use carbon paper. Collate - A finishing term for gathering paper in a precise order. Color bar - A line of colored blocks in a row or a single color placed at the tail of a press sheet and used to measure the density of color across the width of a press sheet. Color correction - Improving color separations by altering either the electronic file or the amount of color burned onto a plate or the amount of ink applied to a press sheet. Color matching system - A system of formulated ink colors used for communicating color. Color separations - The process of preparing artwork, photographs, transparencies, or computer-generated art for printing by separating color into the four primary printing colors: cyan, magenta, yellow and black. Comb bind - To plastic comb bind by inserting the comb into punched holes. Crash number - Numbering paper by pressing an image on the first sheet which is transferred to all parts of the printed set. Crop - To cut off parts of a picture or image. Crop marks - Printed lines showing where to trim a printed sheet. Cyan - One of four standard process colors. The icy blue color. Debossing - Pressing an image into paper so that it will create a lowered area. Densitometer - A quality control devise used to measure the density of printing ink. Density - The degree of color or darkness of an image or photograph. Die - Metal rule or imaged block used to cut or place an image on paper in the finishing process. Die cutting - The process of using a die to cure images in or out of paper. Digital printing - Printing performed on a digital copier, such as a laser color copier or Docutech. Digital proof - A proof delivered electronically, as opposed to physically. The most typical example is a .pdf proof. Direct-to-plate - The process by which plates are created using information sent to a direct-to-plate device from a computer, bypassing film. Dot gain or spread - A term used to explain the difference in size between the dot on film versus the dot on paper. Double burn - Exposing a plate to multiple images. Duotone - A halftone picture made up of two printed colors. E-commerce - The convenient process of ordering products and services online. E-mail - Abbreviation for electronic mail. EBIZ - Abbreviation for electronic business. Embossing - Pressing an image into paper so that it creates a raised area. Emulsion - Light-sensitive coating found on printing plates and film. Flood - To cover a printed page with ink, varnish or plastic coating completely. Foil - A metallic or pigmented coating on plastic sheets or rolls used in foil stamping and foil embossing/debossing. Foil emboss/deboss - Foil stamping and embossing/debossing an image on paper with a die. Foil stamping - Using a die to place a metallic or pigmented image on paper. 4-color process - See process color. French fold - Two folds at right angles to each other. FTP - An acronym meaning File Transfer Protocol. The process of sending or receiving files electronically through the Internet. Not to be confused with attaching an attachment to an e-mail, FTP is performed using an FTP client (software) or a Web page with FTP capabilities. Full justification - Type that is justified to the right and left margins, creating no variation between line lengths on either end; except the last line, which is left justified. Ghosting - A faint printed image that appears on a printed sheet where it was not intended. More often than not, this problem is a function of graphical design. It is hard to tell when or where ghosting will occur. Sometimes, you can see the problem developing immediately after printing the sheet, other times the problem occurs while drying. However the problem occurs, it is costly to fix, if it can be fixed. Occasionally, it can be eliminated by changing the color sequence, the inks, the paper, changing to a press with a drier, printing the problem area in a separate pass through the press, or changing the racking (reducing the number of sheets on the drying racks). Gloss - A shiny look, reflecting light. Gradient - A transition of color, creating a blended change between screen percentages of a single color or between two different colors. Grain - The direction in which the paper fiber lie. Gripper - A clamp-like device which grabs the front of the press sheet and pulls it through the press. Also refers to the edge of the press sheet which leaves the press first. Halftone - Converting a continuous tone to dots for printing. Click here for an illustration . Hard copy - The output of a computer printer, or typed text sent for typesetting. Hickey - Reoccurring, unplanned spots that appear in the printed image from dust, lint or dried ink. Image area - Portion of paper on which ink can appear. Imposition - Positioning printed pages so they will fold in the proper order. Impression - Putting an image on paper. Imprint - Adding copy to a previously printed page. Indicia - Postal information placed on a printed product. Justification - The act of specifying how a block of type will look on a page. See left justified, right justified, Center justified, and full justification. Kiss die cut - To cut the top layer of a pressure-sensitive sheet and not the backing. Sticker sheets use this technique. Knock out - To mask out any area of ink. edges on the right side. Left justified - Type that is justified to the left margin and the line lengths vary on the right. Magenta - One of the basic colors in process color. The pink color. Makeready - All the activities required to prepare a press for printing. Mask - Blocking light from reaching parts of a printing plate. Matte - A dull look, reflecting light poorly. Offset printing - Printing performed on a traditional printer, where plates mounted onto rollers are used to transfer ink onto paper. Offsetting - Using an intermediate surface used to transfer ink. Also, an unpleasant happening when the images of freshly printed sheets transfer images to each other. Opacity - The amount of show-through on a printed sheet. The more opacity—or the thicker the paper—the less show-through. OpenType™ font - OpenType is a new cross-platform font file format developed jointly by Adobe and Microsoft. The two main benefits of the OpenType format are its cross-platform compatibility (the same font file works on Macintosh and Windows computers), and its ability to support widely expanded character sets and layout features, which provide richer linguistic support and advanced typographic control. (Taken from www.adobe.com.) On a Windows machine, OpenType fonts have the extension .otf. Overrun - Copies printed in excess of the specified quantity. page count - Total number of pages in a book, including blanks. press proof - A calibrated color proof to match the full run. Reno Print Store can offer press proofs on certain projects for an additional cost. Press Proofs are not available on gang ran projects. register marks - Cross-hair lines or marks on film, plates and paper that guide strippers, platemakers, pressmen and bindery personnel in processing a print order from start to finish. edges on the left side. right justified - Type that is justified to the right margin and the line lengths vary on the left.